Yesterday I competed in the 2014 Men’s Health Urbanathlon in New York City. I went in thinking the Urbanathlon would basically be like a Tough Mudder course, which I ran in 2012 in New Jersey, minus the mud. Beyond that my frame of reference for timed or racing events is mostly running races I’ve done in Central Park and other parts of New York City, as well as the Anthem Richmond Marathon I completed in 2012 in Virginia. Yesterday’s Urbanathlon was a 10-mile course within Flushing Meadows Corona Park, starting and ending at Citi Field, where baseball’s New York Mets play. Like so many “adventure races,” including Tough Mudder’s rival Spartan Race (not to mention the CrossFit Games and the American Ninja Warrior competition), the gimmick here is that it’s not just a running race–which adventure race promoters often disparage as “boring”–but an obstacle course with running built in. But with the Urbanathlon, I’d say it was essentially a 10-mile running race with a few not-so-difficult obstacles added in. For someone like me, who runs about a 10-minute mile (which is not particularly fast) I had hoped to make up some time against faster runners on the obstacles. I have decent upper body strength and can pull up my body weight pretty easily with my arms, so I figured I’d gain at least a few minutes on monkey bars, wall climbs, etc. However the obstacles were fairly easy to complete and I never felt like I made up more than a couple of seconds on them. I can’t remember any obstacle taking more than a minute or two, at which point it became a foot-race again. 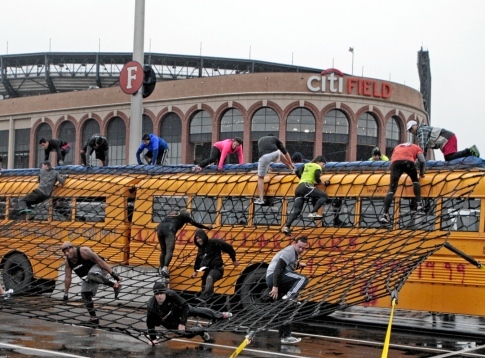 By far the toughest and most unique obstacle I encountered at the Urbanathlon came in the last mile or so of the course, which took us into Citi Field. Once inside, competitors had to walk or run up and down the stands of the stadium for about six sections, a mini tour de stade. (I imagine this would have been much cooler if I was a Met fan.) From there we got to actually run on the warning track of the field–which, even for a Yankee fan, was pretty cool–and eventually out into the parking lot where we crawled under some propped up Volkswagens (sponsor! ), jumped over some NYC taxi cabs (I saw a couple of guys do that slide across the hood thing you see in the movies), and up and down a cargo net stretched over a school bus. I completed the entire course in an hour and 40 minutes, which is just about my usual 10-minute mile running pace (the course was just over 10 miles). Considering my time included conquering 14 obstacles, it’s safe to say they were nothing more than a minor hindrance to my overall pace. Overall I finished in the middle of the pack, 495th out of a field of 1,056. Speaking of time, I had also assumed that like Tough Mudder, there would be long waits for some of the obstacles due to a high volume of competitors. (That race took me almost five hours to complete 12 miles plus all the obstacles.) But at Urbanathlon, I hardly waited for any of the obstacles besides when the people ahead of me started to slow up on the stair climb. The Urbanathlon cost about $100 per entrant (slightly more or less depending on how early you registered). For an event of this distance that’s not a bad price, especially if it serves as the motivation for otherwise sedentary competitors to get off the couch and train for it. As for me, who’s generally pretty active, I was hoping to be pushed to my physical limit a little more than just summoning the stamina to run 10 miles. I thought the mud theme at Tough Mudder was a little overdone, but that event also has some really difficult obstacles outside of the mud, a few of which I couldn’t complete. 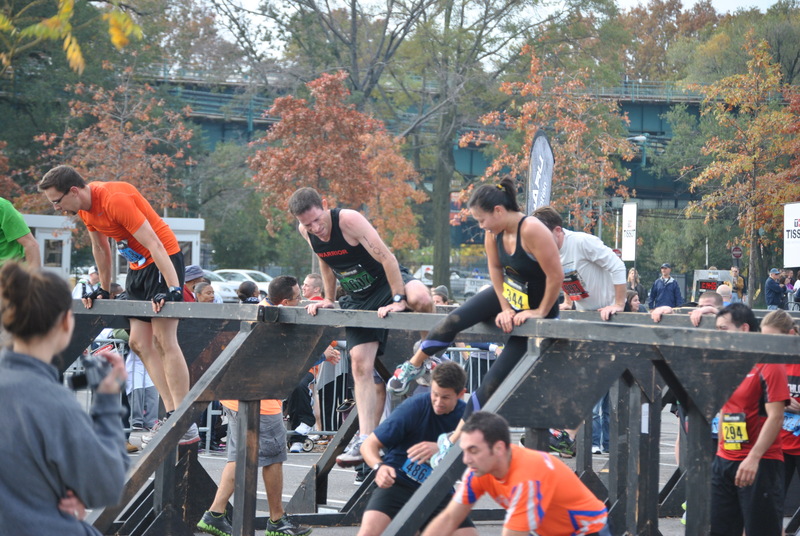 Obstacles aside, the Urbanathlon NYC course was beautiful as a running race. Most people who live outside of Queens (any many who do) don’t realize how much Corona Park has to offer. Aside from the U.S. Open and Citi Field, the park features baseball and soccer fields, water, biking, and even a small zoo. For runners who want a little something extra in their races to break up the all the running, the Urbanathlon is exactly that. But for non-runners in the market for a challenging and fun obstacle course that will test both their upper and lower body, I suggest trying out for American Ninja Warrior instead.